» ALL the Things, no. 1: Join the Revolutionary Horde! One of my many little passions concerns the use of text in visual art. I’m particularly fond of embroidering words. For some reason, the act of stitching a word feels incredibly powerful. Text … textile … texture … it’s all there. 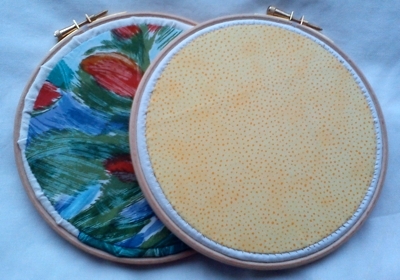 So back in August, when it was suggested that I propose a workshop for the super-fabulous handmAid Craft Day, it’s not too surprising that I ended up teaching a beginners’ embroidery class where we used some simple line stitches to work wordy patterns. Those are my four designs up there. I brought along two copies of each so that people would have a choice. And nobody wanted to stitch “EGO”! I was surprised. Are you surprised? I think that one is deliciously subversive. I have leftover traced designs. I have more fabric. I have a fineliner pen and a makeshift lightbox, and I’m not afraid to use them. So I’m thinking … kits. To complete the project, you will also need embroidery threads and a short length of ribbon or cord for hanging the finished piece. I will be selling sixteen kits in total – four in each design. Each kit is priced at US$27 – including postage anywhere in the world. This year’s posting deadline for parcels sent worldwide from Ireland to arrive in time for Christmas is 6 December. It’s later for places closer to Ireland, of course, but I’m not keen on going down to the wire with these. It’s the Ultimate Answer! To the Ultimate Question! Of Life! The Universe! And Everything! With its open shapes and absence of fiddly bits, this is the simplest of the four designs. Rather like the Answer, really. 42, man. Deep Thought would definitely want you to stitch this. I think this one is my favourite (today, at least). I love the way it quietly turns the social history of embroidery inside out, matching the Victorian ideal “feminine” activity with that indecorous allusion to the self – writ LARGE, and all. Bold curves, straight lines: “EGO” is more of a challenge than “42”, but not by much. Do you have what it takes to stitch this? This design was the most popular at my workshop in September. I love the simple exhortation. Unassuming, yet assertive. Quietly exciting. Tighter curves and more complex letter shapes make “dare” a little more challenging than either “42” or “EGO”, but it’s still well within the reach of a beginner. The Revolutionary Horde: Oh … I just got that. Oh dear. Me: This tendency, as I was saying … to embroider … THE TRUTH! You can now buy all four designs for the price of three. That’s $81, instead of $108, saving you $27. Please tell me in the PayPal “notes” field if you’d like the kits packaged separately when I send them to you (for instance, if you’re giving some or all of them as gifts). Otherwise, I’ll do the sustainable thing and use one set of packaging for all four. Deadline is still this Friday! 4 comments to New Embroidery Designs! Lot of questions in my mind regarding Embroidery Digitizing Digitemb and its solutions. Your detailed analysis answers my all queries. In future it really helps me out. What a great piece of Hand Embroidery. Are you also into digitizing and Machine embroidery? Again, very talented! Thank you for your article! This is info that is very interesting. Your efforts are really appreciated by me. I will be your normal reader. I believe you like your job. Thanks for the top high quality material.